The University of Wolverhampton’s Science Centre has been nominated for two national awards. 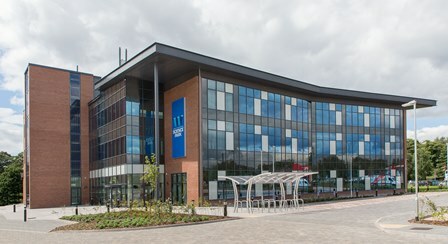 The £10.1m centre located at the University of Wolverhampton Science Park, opened last year. Designed by Fairhursts Design Group and built by Clegg Construction, the centre provides high quality workshop, office and category 1 and 2 laboratory space over 4,000 square metres. The facilities at the Science Centre support the Black Country’s Smart Specialisation strategy agenda and were part-funded by the Black Country Local Enterprise Partnership (LEP) and the University of Wolverhampton. The aim of this is to boost output in priority sectors such as aerospace, automotive, building technologies, and life sciences and therefore help the region to remain competitive in national and international trade. UKSPA Executive Director Jim Duvall said: “The awards celebrate and recognise the work that UKSPA members do to support, develop and grow their businesses community. The sheer volume of high quality entries received made the shortlisting of Award entries an exceptionally difficult task. “University of Wolverhampton Science Park and the other shortlisted entries are to be congratulated for their commitment to deliver exceptional locations that provide the very best opportunities for innovative companies to thrive. We look forward to announcing the awards at our national conference in Birmingham next April”. The centre has been shortlisted and won a number of awards since opening including winning the Best Large Commercial Project at the LABC regional awards and also being a national finalist in the same category.